Amy's LA Wine Blog: No Wonder We Love Brunello. No Wonder We Love Brunello. The U.S. accounts for 25 percent of all Brunello sales (6.5 million bottles per year total output). There is really no wonder we love these wines. They can be voluptuous but supple and can take us to a special Tuscan place, in our minds. OK, enough of the sappy stuff. 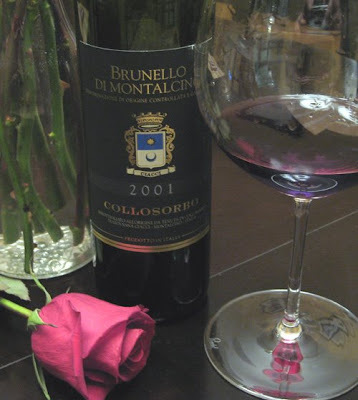 This 2001 Collosorbo Brunello di Montalcino is exceptional. It has an amazing perfumed nose of red cherry fruit, licorice and minerals. There are layers of ripe fruit on the palate, great acidity and rounded tannins balance it all. But one of this wine's best qualities is its silky texture. The more and more I taste, texture means a lot to me. This wine is elegant and full-bodied at the same time. That kind of quality cannot always be achieved, but when it does happen, it creates a special experience. Go out and find some 2001 Brunello (if you can find any) before the amazingly expensive and not-ready-to-drink-yet 2004's come out, starting next month! And from Amy: I love the guest blog!!! I am honored to be a guest blogger... and, I think, the first. Maybe Julian will start reading again and contribute! Julian has given up on me - don't blame him!! !